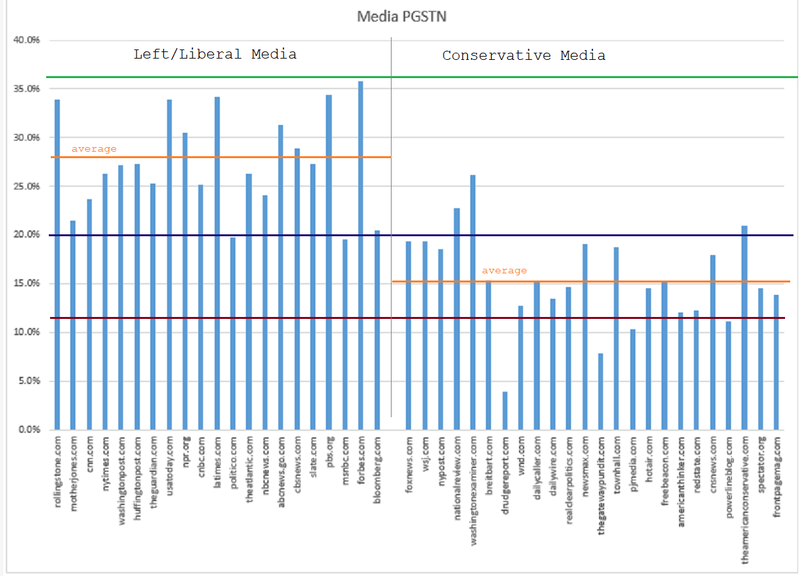 A new research paper from Leo Goldstein claims to have quantified Google's bias against leading conservative sites—including PJ Media—in search ranking, especially (but not exclusively) in the area of climate change. "Google Search is found to be biased in favor of left/liberal domains and against conservative domains with a confidence of 95%," Goldstein found. "Further, certain hard-Left domains have such a high [percentage of domain traffic, referred by Google Search, net of brand searches] that their standing raises suspicions that they have been hand-picked for prominent placement," he says, adding that "certain respected conservative domains are blacklisted." You might be interestted to learn, that your websites have been almost blacklisted by Google. "Almost blacklisted" means that Google search artificially downranks results from your websites to such extent that you lose 55% - 75% of possible visitors traffic from Google. This sitution is probably aggravated by secondary effects, because many users and webmasters see Google ranking as a signal of trust. On first glance, this sounds like a clear case of bias. However, there are some factors to consider. First, Alexa is not known to accurately reflect a site's internal numbers, relying as it does on "estimated" metrics. PJM's actual Google organic traffic referral percentage, for example, is higher than what Alexa reports. And Alexa's estimate is based on their estimate of total traffic to a site. So, for example, if a site gets a large percentage of traffic from another source (e.g. Drudge or Yahoo) the percentage of Google organic traffic will naturally be lower. In addition, Goldstein admits that he holds "short positions in Google stock," which means he is essentially betting their stock will drop. That introduces the possibility of bias into his assessments. Developing changes to Search involves a process of experimentation. As part of that process, we have evaluators—real people who assess the quality of Google’s search results—give us feedback on our experiments. These ratings don’t determine individual page rankings, but are used to help us gather data on the quality of our results and identify areas where we need to improve. Last month, we updated our Search Quality Rater Guidelines to provide more detailed examples of low-quality webpages for raters to appropriately flag, which can include misleading information, unexpected offensive results, hoaxes and unsupported conspiracy theories. These guidelines will begin to help our algorithms in demoting such low-quality content and help us to make additional improvements over time. Who are these "real people" Google is using as evaluators? We're not told. And what's their definition of an "offensive result"? We don't know that either. But in light of Google's history (firing an employee who ran afoul of the company's SJW orthodoxy, working with left-wing groups to root out and threaten "hate" sites on the Internet, and blacklisting sites they find to be objectionable) there's probably not a high likelihood that these people lean conservative—or even moderate. That doesn't bode well for conservative sites going forward. That said, the Google algorithm is complicated and constantly changing—and a highly guarded secret. There's no way to know whether a drop in search traffic is a result of changes in user behavior (i.e. fewer searches for a particular topic) or even the result of changes to the back or front end of a website (Google is reportedly cracking down on interstitial ads). Goldstein concedes at the end of his paper that the "PGSTN of individual domains is not sufficient for conclusions." Knowing what we do about the liberal leanings of Google executives and employees, the possibility of bias being incorporated into the search algorithms cannot be ruled out. Algorithms, in the end, only do what the human programmers tell them to do.